The What: Solid State Logic will showcase the SSL ‘Live’ console at the 2014 ISE show (Stand 7.H18). 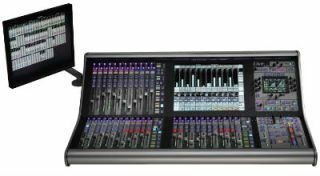 Since its announcement at ProLight + Sound in 2013, the SSL Live console has rapidly become the audio console the industry is talking about. Coinciding with the roll out of a global resale partner network and the first commercial sales, SSL’s presence for the first time at ISE signals a strong long-term commitment to the installed systems sector. The What Else: Live brings SSL’s approach to audio quality and console ergonomics to sound for live audio production. SSL has been at the edge of analogue and digital audio console innovation for over 35 years. Live brings something new and very special to the party. Live is a flexible and powerful digital audio console designed specifically to meet the demands of all aspects of live sound production. It is suited to touring or installation, FOH or monitors, to venues and arenas, houses of worship and concert halls, to anywhere where audio quality is important and engineers require power, complete flexibility and a user interface that puts them in control. Live is all about power and control. Based on SSL’s new Tempest processing platform, Live has plenty of power and it is deployed in a versatile way. The headline numbers are impressive at the price with 976 inputs and outputs and 192 full processing audio ‘paths’ at 96kHz. How those ‘paths’ are utilised is extremely flexible with power allocated to Channels, Auxes, Stem Groups and Masters configured to suit the needs of each show. All processing is built into the console surface and it has a collection of I/O connectivity built into the frame. A full range of Stagebox I/O connects to the console via MADI with the potential for larger systems to make use of SSL’s own Blacklight technology that carries up to 256 channels of bi-directional audio and control via a single fibre connection. Power really is nothing if it can’t be controlled and Live offers a suitable control surface. It combines multiple tablet style multi-gesture touch screens with hardware ergonomics, visual feedback and a collection of new features. It enables engineers to work how they do today, whether they prefer new touch screen or classic hardware technology, or like to combine them both, and offers new and better ways of doing things that will make life less stressful and more creative. One More Thing: Being an SSL, Live has legendary audio performance as standard. Audio quality is a primary design feature right the way through from studio grade SuperAnalogue mic preamps, 24bit/96kHz A/D D/A conversion, to 64bit internal processing and 96khz operation throughout. An obsession with quality also shines through an array of channel processing tools that bear the classic SSL tone but bring a completely new level of precision, flexibility and usability. Live features an impressive collection of 30 new Effects and audio analysis tools which take SSL’s acclaimed studio grade processing and re-craft it for live and they have their own dedicated processing power.